Parallax (see figure 1), as applied to a learning, teaching, gallery presentation, and research environment, is, "the apparent change in location of an object against a background due to a change in observer position or perspective shift. The concept of parallax encourages researchers and teachers to acknowledge and value their own and their readers’ and students’ shifting subjectivities and situatedness which directly influence the construct of perception, interpretation, and learning" (Sameshima, 2007, p. 2). 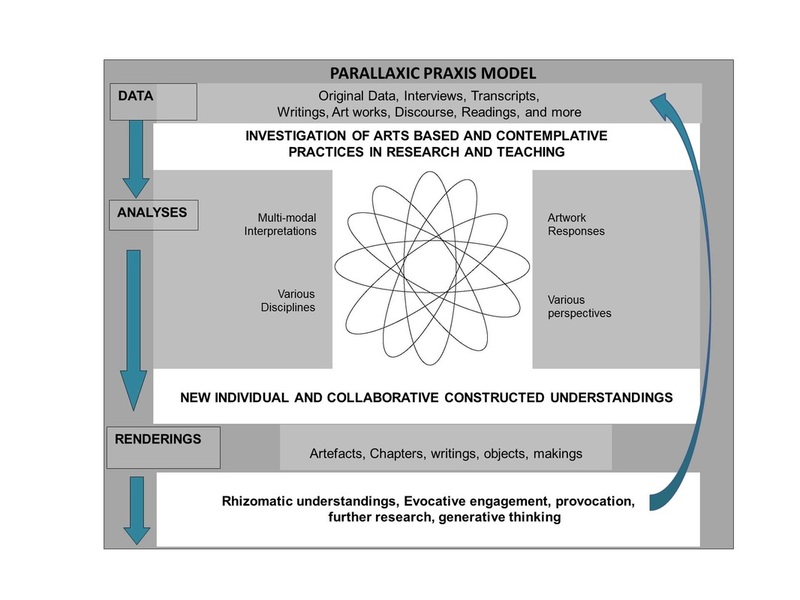 The Parallaxic Praxis Model (see figure 2) can be used both as an interdisciplinary research framework and as an educational framework in teacher education programs and formal K-12 settings to structure inquiry through dialogic and multi-modal means of accessing, engaging, and representing learning. There are three organizational phases in the model framework. In the Data Phase, researchers collect data in traditional and non-traditional ways. In the Analysis Phase, researchers from different fields interpret the data through various methodologies (a/r/tography, life writing, poetic inquiry) and mediums (theatre, music, poetry). The aim is to look at the data from various disciplines, lenses, and modalities as a means to complexify the interpretive possibilities and to generate collaborative dialogic analyses. In the Rendering Phase, the completed artefacts created during the previous phase are then used as juxtaposed touchstones for the interdisciplinary team to discuss their analyses, methodological processes, and creative practices. As well, these artefacts can be used as teaching tools in formal and informal education settings to mobilize knowledge. The five catechizations that are used to frame discussions about artefacts are: Mimesis (relational), Palimpsest (depth), Intertexuality (breadth), Aporia (conditions), and Sorites (cumulative).